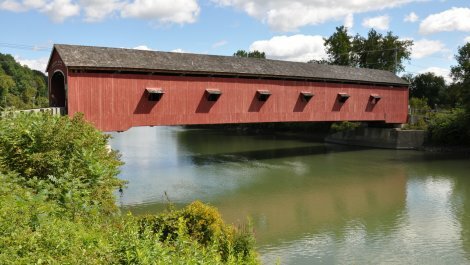 The Buskirk Covered Bridge is the only inter-county covered bridge in New York State, joining Rensselaer and Washington Counties. It is one of four covered bridges still standing in Washington County. It is owned and maintained by both Rensselaer and Washington Counties and carries traffic across the Hoosic River. 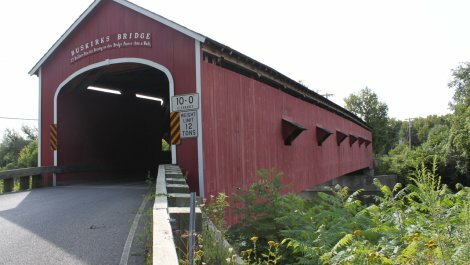 The other two bridges are owned by Washington County, and one − the Shushan Covered Bridge – is owned by the town of Shushan. 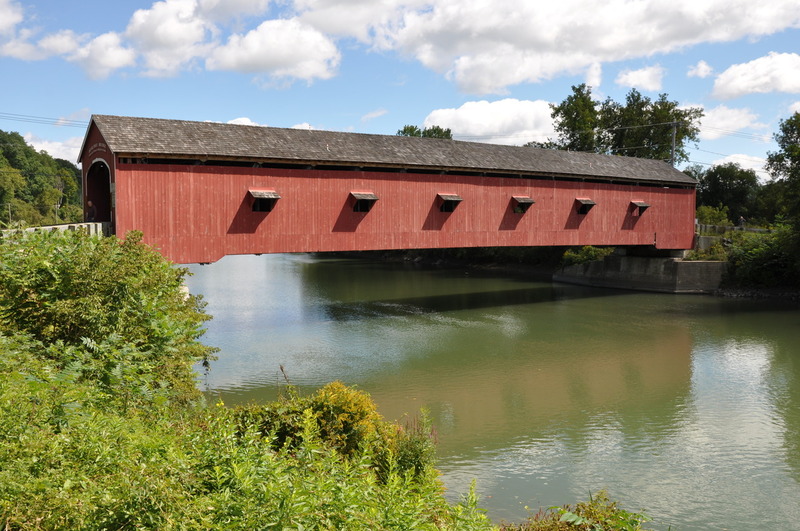 Built by Peter Osterhauth, Charles Newman, James Roberts and Charles Ingalls in 1857, this 158-foot-long, single span structure incorporates the Howe truss design patented in 1840, and improved in 1850, by William Howe of Springfield, Massachusetts. 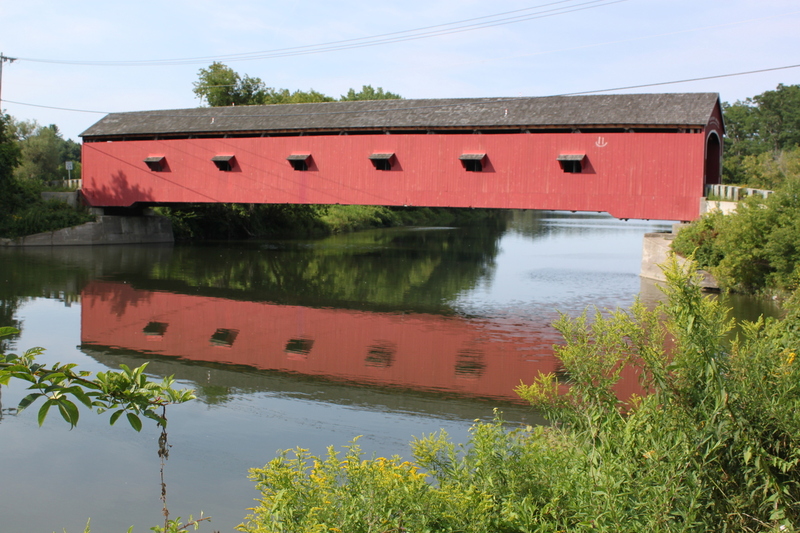 It is one of only three Howe truss bridges in New York State. Martin van Buskirk and his brothers were Revolutionary War veterans. Legend has it that the van Buskirk families were ferrymen prior to 1804. When Martin married one of Stephen Rensselaer’s daughters he benefited from her considerable dowry, which included 1,800 acres of land on both sides of the Hoosic River. Martin van Buskirk was one of the influential personages who saw the potential for profit in a transportation link from the Hudson River northeastward to Granville, New York. The river crossing at Buskirk is at a point where the Hoosick River widens into broad flood plains. In 1804, this location was deemed suitable for the construction of mid-channel piers for the support of a multiple-span log bridge. It is unknown how many times traveling across this bridge was interrupted by springtime ice breakup or heavy summer storms, which can suddenly make the river a raging, destructive torrent. A more sophisticated bridge was built in 1812, possibly a single-span open timber truss similar to one built across the Hudson River in 1804 by Theodore Burr. A bridge of this design would have been set high enough to escape the ravages of ice and flood. It can be inferred that it was the lack of a roof that necessitated extensive repairs in 1849 and 1860. 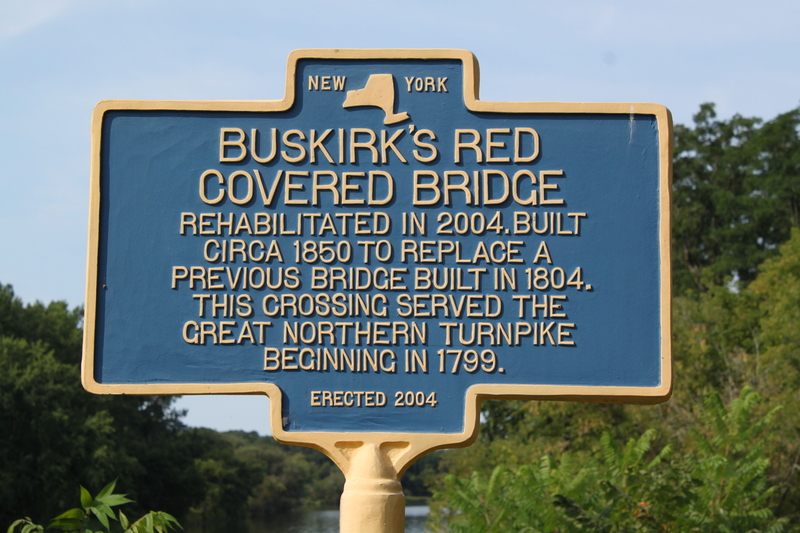 The present bridge at Buskirk was originally commissioned to be built by the towns of Cambridge and Hoosick. Construction began after July 21, 1857 and was completed before November 14, 1857 − about 3½ months. One would think that the misfortunes of previous bridges at this crossing point would have prompted the builders to design for the worst conditions, but in 1880, a flood caused extensive damage. In the flood of 1927, which swept away many covered bridges in the area, there was two feet of water over the floor of the Buskirk Covered Bridge. In 1959, ice pushing against the bridge caused it to bow more than a foot in the middle. Ice again damaged the bridge in 1976. After a damaging flood in May that same year the bridge was raised two more feet. 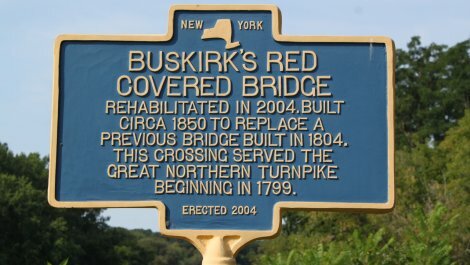 Buskirk’s 20th Century history is peppered with ‘yellow flags’ and ‘red flags’ issued by New York State bridge inspectors. A yellow flag indicates the inspector’s concern about a condition that needs attention but is not an immediate safety issue. A red flag indicates a serious structural flaw that must be addressed within 24 hours. Possible remedies include (a) an appropriate repair; (b) closing the bridge; (c) lowering the posted load rating. Periodic attempts by the County Department of Public Works and hires to remedy structural problems were sometimes actually detrimental to the bridge. The posted load rating has been as low as 1½ tons (1930) and as high as 6 tons (1960). At the time it was closed in August of 2002, it was posted for 3 tons. 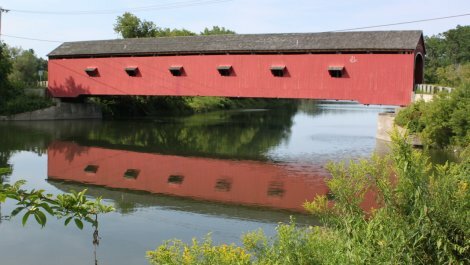 In 2004-2005, the Buskirk Covered Bridge experienced a complete rehabilitation. On August 4, 2007, Washington County hosted a celebration of the newly rehabilitated Buskirk, Eagleville and Rexleigh Covered Bridges. 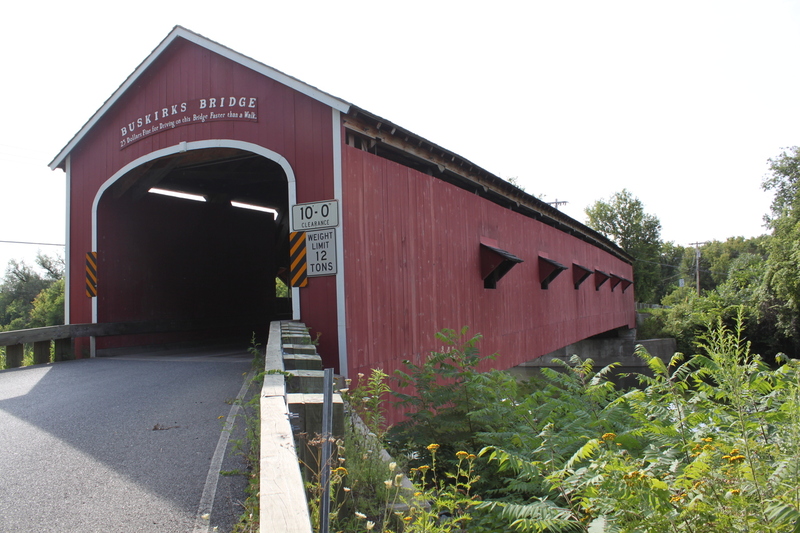 Washington County is to be commended for its efforts in preserving their covered bridges.